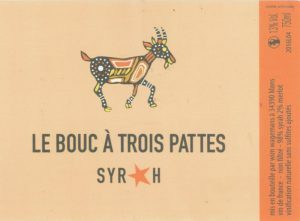 Le Bouc à Trois Pattes means “The Three-Legged Goat” – apparently named after a mass produced “supermarket” wine that featured an animal with five legs. Having spent a jovial lunch with Wim Wagemans and his friend and our long time producer Axel Prufer, we know he has a good sense of humour! Wim’s vineyards are located in the beautiful Haute Vallee de l’Orb just south-west of the village of Bedarieux. This is indeed rugged country with forested mountains cut through by the Orb River that flows past Axel’s winery near Le Mas Blanc then on to Bedarieux then past Lamalou where Wim’s vines are and then in a huge arc down to the picturesque town of Roquebrun where we had that lunch. Wim has around five hectares of vines which he tends using biodynamic principles. He has Carignan, Grenache Blanc, Syrah and Chardonnay. The harvest in 2017 was almost non-existent for Wim but he was able to retrieve a tiny allocation of one of his 2017 wines and a couple of his 2016 wines for us to bring to Australia. Wim does not use any sulphites in his wines. 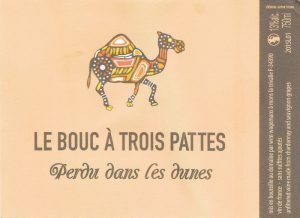 Perdu dans les Dunes actually has a drawing of a three legged camel (hence the lost in the dunes reference and a continuation of the “Trois Pattes” theme). This is a macerated wine made from 100% Grenache Blanc grapes that have been grown using biodynamic principles. The grapes were left in the juice for nearly a month to extract the polyphenols from the skin which comprise anthocyanins for the colour, tannins for the mouth feel and aromatic compounds that give the distinctive aromas. It is a delicious wine to have with food. No sulphites have been added at any time. 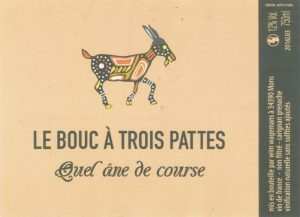 The Quelle Âne de Course (what a racing donkey) is a beautiful silky red wine made from Carignan which thrives in this area. In fact, this area is very close to Saint Chinian where Carignan reaches its best expression. We import quite a few wines made from this grape and they are all delicious. This one is no exception – you will be able to detect the trademark raspberry and strawberry aromas and maybe even some hints of rose petal. To round out the wine, Wim has added 20% of Grenache. This wine called Syrah is made from 98% Shiraz with just 2% Merlot which is just detectable even though it is only such a small percentage. Do not be fooled, however! This is not a big, bold alcoholic Shiraz like those found in the Barossa Valley. It is a bold colour and looks weighty but instead has a light elegance on the palate. It is a beautifully made wine which will appeal to those who appreciate subtlety and elegance rather than sheer power.